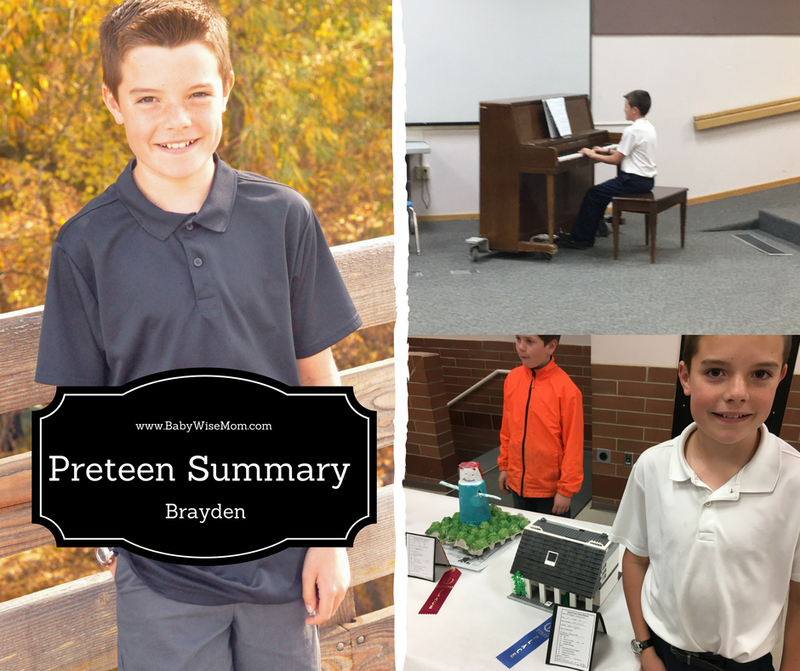 This is a summary for Brayden from 11.25 years old to 11.5 years old. Guys. 12 years old is a huge milestone for us in our church culture. I can NOT believe my child is almost 12. Can’t. Eating is great. It seems to me that his taste buds are maturing. He hasn’t ever been a picky eater at all, but he has still been a child. He just seems to be liking flavors more that are traditionally like more by adults than children. We had NO stress issues about falling asleep during his period. I think he has really been figuring himself out and learning to quiet his brain when he starts to worry he won’t fall asleep quickly. I totally understand that panicky feeling; I got it every time I had a nursing baby. I could not fall back asleep after nursing a baby because I would be so worried about getting enough sleep. I am glad he has been figuring it out. Brayden is still a sweet and kind big brother. His sisters all love him. Brinley currently has plans to marry him because she, “loves him so much and he is so cool.” I think that just shows what a great brother he is. Piano is back up and in full swing. Brayden loves playing instruments and especially loves the piano. He played basketball during this time. He had a great team and they had a lot of fun. It was a short, four week season with double headers every week. I actually appreciated that because games are now done! They have always gone into December in years past, and that is just hard. He also has swim team going on. He is really loving swim team. At his last meet, for his first race, he got basically the exact same time. He was frustrated by that because he is used to dropping time consistently right now. In an effort to provide some motivation, my mom offered to pay him if he dropped time on his next race. She started with, “If you drop 10 second in your next race…” This is where I interrupted her. “Ten seconds is a ton of time. That is unheard of.” She then asked what would be a big goal but attainable. I suggested she just do one dollar per second. He typically drops 1-3 seconds per race per meet. So he went out for his next race and dropped 12 seconds. Yes, 12. We found that hilarious and assured my mom there was no way he would drop 12 again. So for his next race he dropped 20 seconds. Yep! 20!!! Haha! Unheard of. His next race was the butterfly and also his fifth race so far that day (including a relay he swam in), so he didn’t drop time then. He was beat. But he had a pretty awesome day. School is going well. It is an interesting year for Brayden and his fellow sixth graders. Sixth grade has always been in the middle school. This year, it moved into the elementary school. It has kind of been a learning year for everyone with that dynamic. Brayden is still in the gifted and talented program. He really enjoys that time to push himself and to interact with the other kids in the program. Above you can see him giving a presentation created in that class. There are fun things I hear from people about him. One day, our school did a “Walk to School” day where we helped educate on safe routes for getting to school. I was a ways away from the school at a corner helping kids navigate that spot. Once all of the kids were past, I walked to the school to check and see how things went there (I am the PTO president). The ladies over the event told me that when Brayden got there, he immediately jumped in and helped them carry stuff and set things up (they had offered a light breakfast as kids got to school). They commented on how impressed they were with him and what a great help he was. Our school did a mile run for our fundraiser this year. Brayden killed it with a time of 6:47. He went much faster than I anticipated, so I didn’t count where he was in his grade, but he was way up there. He trained on his own and really pushed himself to improve.